While mystery and intrigue go hand-in-hand with Insular manuscripts, perhaps none is more tantalizing than the space which might hold erasure on page 141 of the St Chad Gospels. The St Chad Gospels spent part of its early years in Wales, resulting in this great gospelbook containing the oldest surviving examples of Old Welsh writing. These circumstances have inspired much speculation about this space. Scholars have proposed a number of reasons for a potential erasure, yet all of these speculations have counter possibilities. Discerning what might have been contained within this space is difficult. Bleed through from the other side of the page, fibers in the vellum, and marks from the scraping of the vellum during its preparation complicate the viewing experience and lead to questions about what is being seen. The thirty-two provided multispectral visualizations present some help, especially when overlaid with the RGB or ultraviolet image in the viewer and the transparency adjusted through the slidebar to sort out some of these viewing complications. At the International Congress on Medieval Studies (2016), Roger Easton was kind enough to re-process the multispectral images for page 141. The charteuse in the center suggests remnants of letters. Imaging with fluorescence light just might capture more of what might still remain beyond human sight. 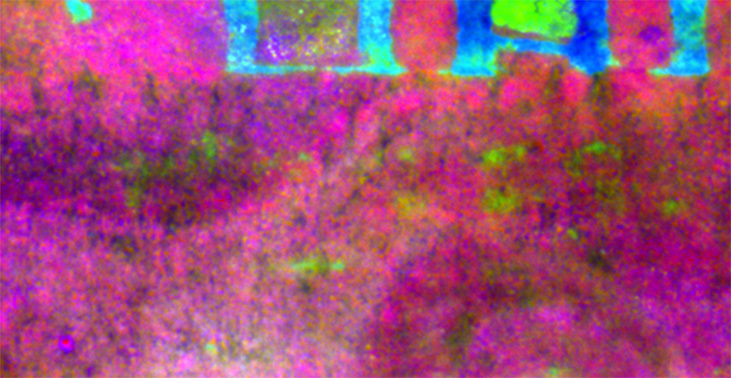 Selection of multispectral visualizations for pg 141. The earliest entry (in content) begins just below the upper frame. 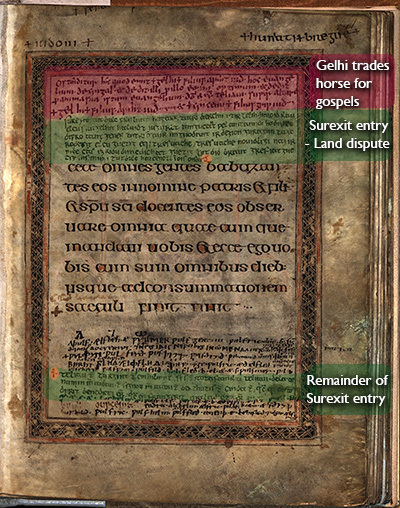 It records Gelhi trading a horse for this great gospelbook and donating it to the Church of St. Teilo (highlighted in red). Scholars have proposed that this entry was recopied to this page, a monk transferring it from the back of the gospelbook and placing it deeper within the manuscript for protection. The second entry, known as the Surexit memorandum, written in what appears the oldest ink (highlighted in green), records the settlement of a land dispute. It is in two parts. Connecting the two parts are a barred d and obelus, marked by small, orange circles. If this is the oldest entry on the page, it raises questions about the division. Why would a scribe divide an entry if open space was available either above or below the last eight lines of Matthew's gospel? In the lower portion of the area that might include erasure are a group of Anglo-Saxon names. Was writing erased to make space for these names? If so, why was this space so important to prompt an erasure when ample space appears on other significant pages? Some of what appears to be erased text is nestled within the last line of Matthew's gospel. If what we are witnessing is erasure, why was text written so near the sacred script—particularly if this is an early entry, written when plenty of open space would have been available? Was writing so near the Matthew text an aesthetic choice to retain ample white space between the text and the page's decorative border? Was there a spiritual reason from writing near the gospel text? Was something written that perhaps later became viewed as incorrect doctrine or infringing upon the aesthetics of Matthew's script? Or, are our eyes deceiving us into thinking this is an erasure? Many questions and possibilities exist.